Wildlife traffickers don’t even have to actually breed tigers. 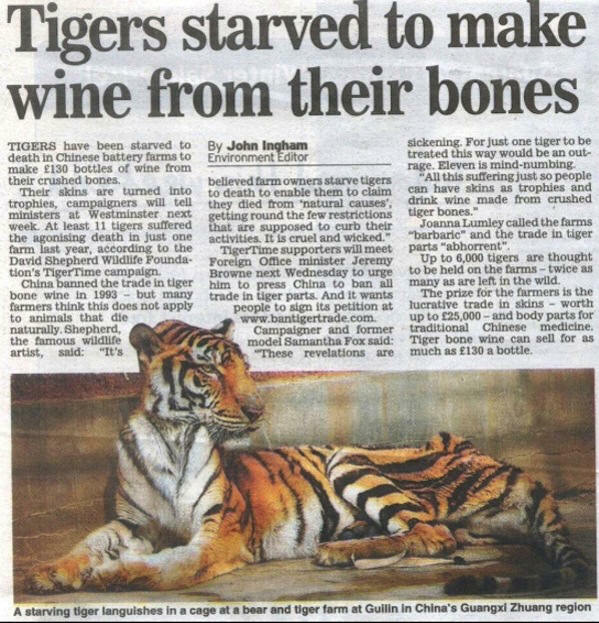 They can just set up a location where it looks like they are captive-breeding tigers, then poach tigers from the wild and sell the parts as though they were from captive bred animals. This apparently works for any species, not just tigers. Although it does certainly appear that people are breeding captive tigers to sell for parts (in what way does this significantly differ from modern cattle operations? ), I have been unable to verify whether or not the farms are also, specifically, starving tigers to death to satisfy nebulous legal issues requiring that the animal have died of “natural causes” for its parts to be sold, as in the following image I found floating around today. The image appears to be a scan of this news article, sourced from this blog entry from the TigerTime web site, which appears to reference a paper called the Straits-Times but was written by a TigerTime employee with no readily apparent source.